Noah’s Ark is located in Fairfield, Iowa, in the southeastern corner of the state, between Ottumwa and Mt. Pleasant. Many people find that Google Maps and MapQuest do NOT provide accurate directions to our shelter. Please follow the directions provided below. You can also print these directions (PDF) and take them with you. From West Burlington Avenue (Business Highway 34), go North on 9th Street (at Family Video). Travel approximately 8 tenths (0.8) of a mile to Gear Avenue. (Before you come to Gear Ave., you will go over a railroad track.) Turn West onto Gear Avenue. 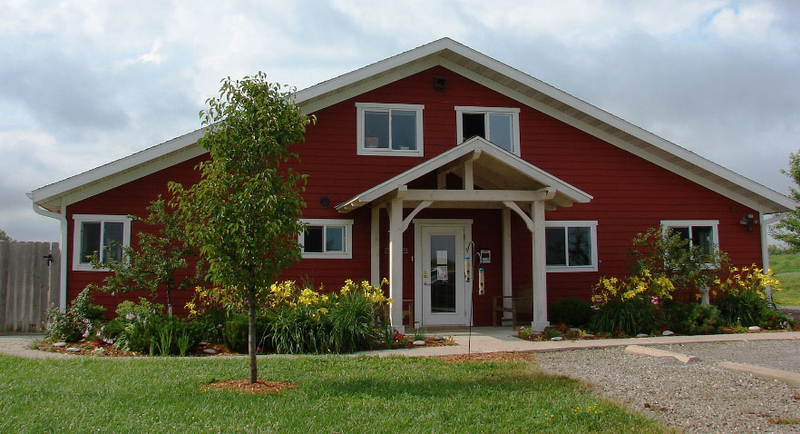 Travel approximately 7 tenths (0.7) of a mile to the Noah’s Ark Animal Foundation shelter. The shelter sits back off the road, on your left. From the East: From Highway 34 (US-34 W), take the first Fairfield exit for Burlington Ave. Turn right onto W Burlington Ave. Travel approximately 3 miles on West Burlington Avenue, then go North (right) on 9th Street (at Family Video). Travel approximately 8 tenths (0.8) of a mile to Gear Avenue. (Before you come to Gear Ave., you will go over a railroad track.) Turn West (left) onto Gear Avenue. Travel approximately 7 tenths (0.7) of a mile to the Noah’s Ark Animal Foundation shelter. The shelter sits back off the road, on your left. From the West: From Highway 34 (US-34 E) take the first Fairfield exit (Burlington Ave). Turn left on Burlington Ave. toward Fairfield, then go North (left) on Brookville Rd. (at the Ford dealership). Travel approximately 8 tenths (0.8) of a mile to Gear Avenue (County Rd. H35). (Shortly before you come to Gear Ave., you will go over a bridge.) Turn East (right) onto Gear Avenue. Travel approximately 8 tenths (0.8) of a mile to the Noah’s Ark Animal Foundation shelter. The shelter sits back off the road, on your right. You can also print these directions (PDF) and take them with you.